Sharp crisp white boxes give shipments a quality impression. Tough and durable standard boxes for almost anything! Meets all shipping requirements of UPS, FedEX, USPS and others. White corrugated boxes create a look that gets noticed. They are as professional as the standard brown corrugated boxes, but they have a crisp, clean look that stands out, no matter where they are. Using them, you’ll create a distinctive look for your business that will impress your customers and increase their satisfaction with their experience. Each white corrugated box stands up to 200 pounds of pressure, ensuring that your products will make it to their destination safely and without being crushed or damaged. With the white box, you can also include stickers with your logo or other information, helping it to stand out more. 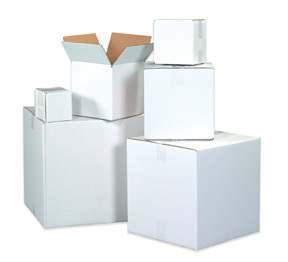 Boxes are sold in a variety of sizes, so you can find the right solution for your products. They are also sold by the case, so you can save money by buying in bulk. Browse by length to find the boxes that are right for your business.